Right - Paul Murnaghan, A series of attempts to record reality: No. 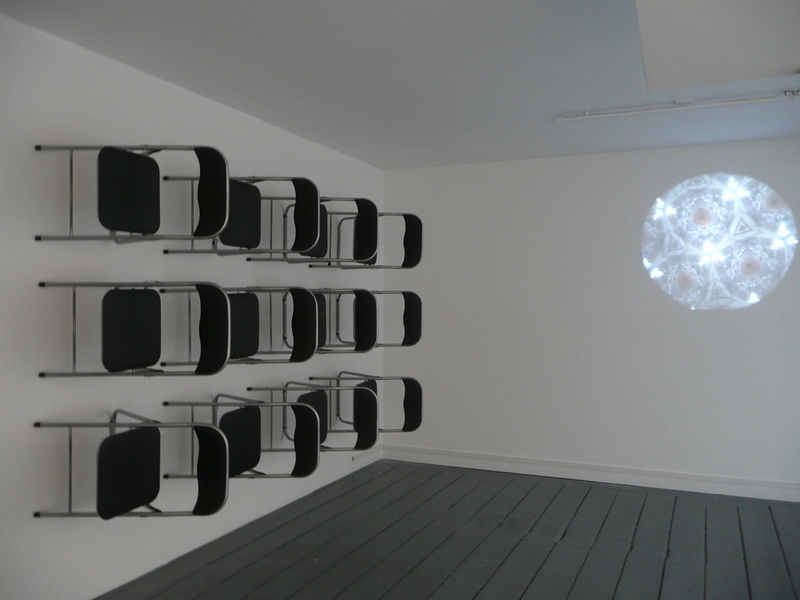 4 (efficacy), 2008, dvd projection. 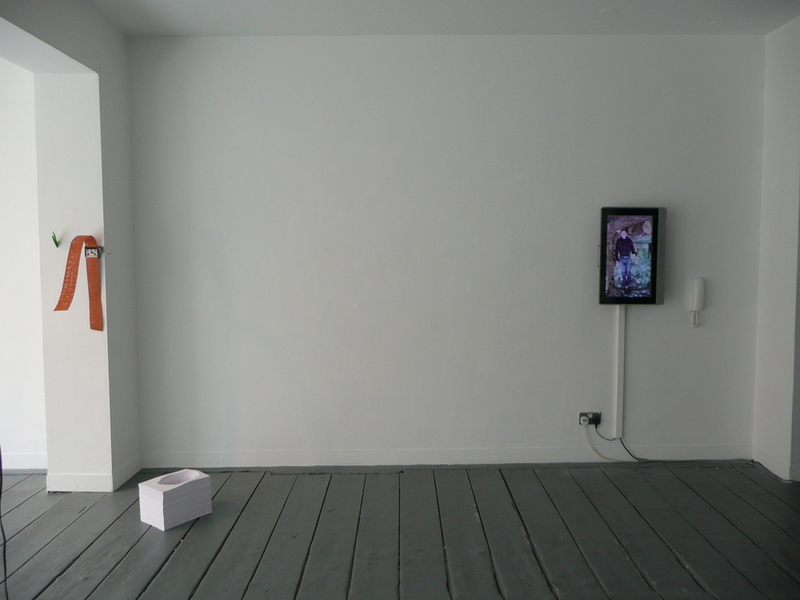 Left - Roisin Cunningham, Small Speakers Reaction, Middle (painting on wall) - Beth O'Halloran, Covered Up, oil on wood & Cross stitch for an injured pigeon,watercolour, Middle (on wall) - Mark Garry, Another Subjective Interpretation, 2008, Componium, punched paper & Feathers. Right (on floor) - Sarah Lincoln, Interrupted Stack, 2007, paper. Left - Mark Garry, Another Subjective Interpretation, 2008, Componium, punched paper & Feathers. Middle - Sarah Lincoln, Interrupted Stack, 2007, paper. Right - Brian Duggan, The First Thing you Learn is you Gotta Wait, 2008, variable. Left - Paul Murnaghan, A series of attempts to record reality: No. 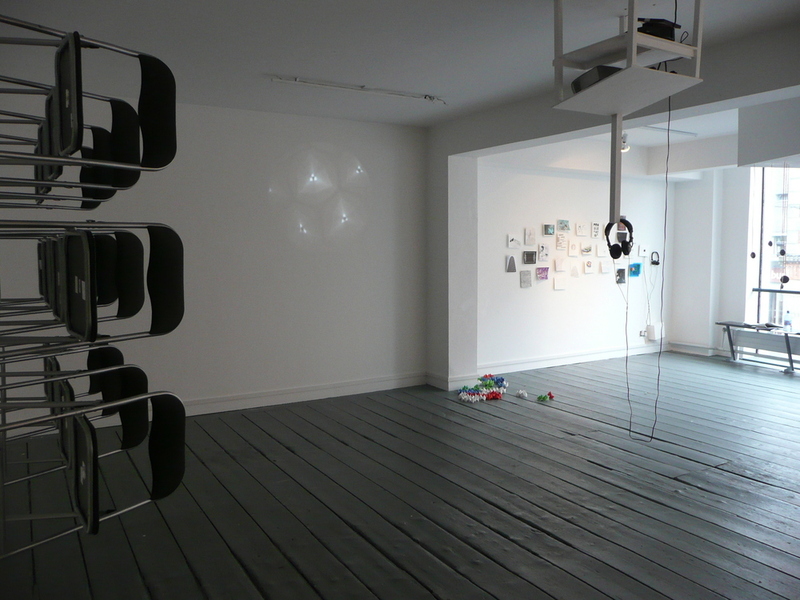 4 (efficacy), 2008, dvd projection. *We met Paul, were given monoscope, shot studio 6, returned monoscope, Middle - Monica Flynn ( work on paper 30.) Elements towards an expanding geometry of chance and circumstance, origami & audience participation. Right - works on paper by various artists. Works on paper by various artists (see text). As a way of making accessible and disseminating the work of alumni and current Mavis students to eachother and to the public we decided to invite all to make work on paper available for sale at a nominal fee of 50 euro. For this exhibition co-curator Caroline Cowley and I invited all MaVis alumni and current students to create work. 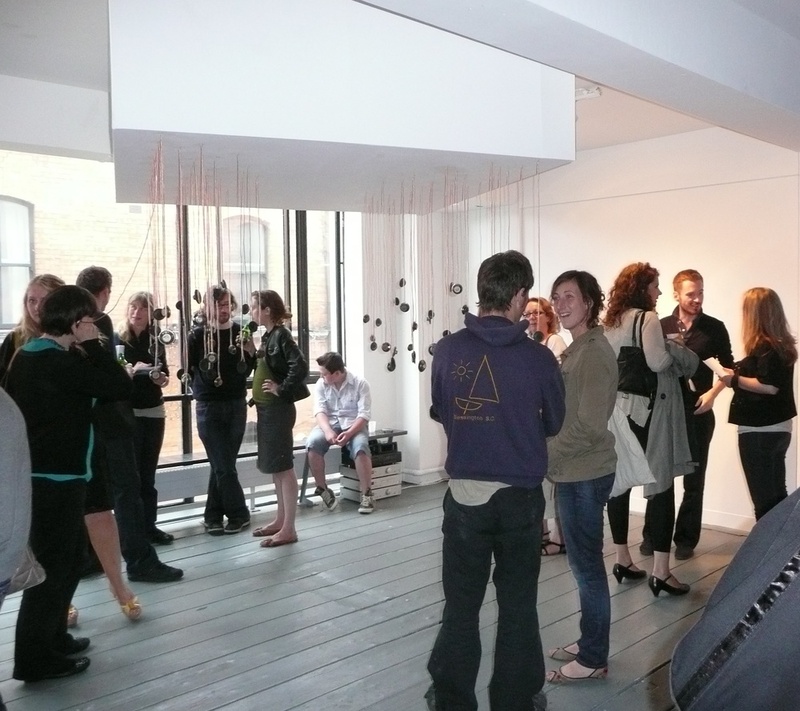 This included a mixture of site-specific pieces, selected older works and a collection of works on paper available for purchase for the nominal fee of €50. 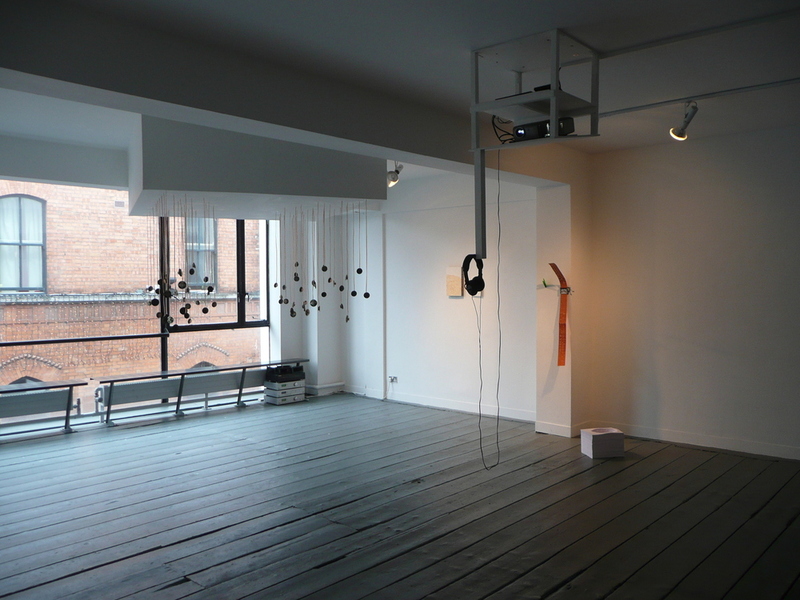 Exhibited work was by Beth O’Halloran, Paul Murnaghan, Brian Duggan, Mark Garry, Aileen Lambert and Roisin Cunningham. New works on paper were by Padraic E Moore, Helen Carey, Elaine Byrne, Fiona Fullam, Sinead Curran, Maeve Mulrennan, Dan Chester, Kitty Rogers, Susan Thomson, Linda Shevlin, Denise McDonagh, Celine Sheridan, Elaine Hurley, Roisin Ni Maoilearca, Sarah Lincoln, Terry Markey, Stephen Blades, Aileen Lambert, Helen Hughes, Bea McMahon, Sally Timmons, Marguerite O’Molloy, Claire Behan, Monica Flynn, Sinead Hackett, Orla Whelan, Deirdre Morrisey, Dee Ambrose, Colleen Lambe, Hilary Williams, Tom Flanagan, Sarah Hurl, Jennie Guy, Vanessa Marsh, Dara McGrath and Dawn Williams.